[blurb on back of disc] Did you miss that TV sensation, the “Six Wives of Henry VIII” season of the hit show Survivor? Now you can catch up—without even having to watch umpteen hours of sixteenth-century women competing at degrading and anachronistic tasks! Our popular condensed version cuts to the chase, showing you the final scene of each episode to answer that burning question: who gets voted off the island THIS week? 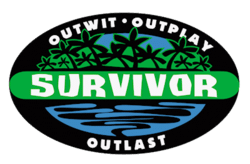 And, of course—if you’re one of the few people in the world who hasn’t heard the news yet—you’ll discover the identity of our final “survivor”! Anne Boleyn (plucking her squealing cousin out of the thorny roses with one hand while mopping her brow with the other): So, anyone ever figure out why we’re here? I thought we were supposed to be on an island. Catherine Parr: Oh, but this is an island. (Rolls her eyes.) You know, as in “this royal throne of kings, this scepter’d isle”—yadda, yadda—“this England.” They played up the Shakespeare angle so they wouldn’t have to spring for plane tickets. Catherine of Aragon (wistfully): I wanted palm trees. (They are interrupted by a loud fanfare, at which sound the wives quickly sit up and slap strained smiles on their faces. In bustles the week’s MC, Cardinal Wolsey, followed by a bevy of courtiers and—looking as if he just popped out of the famous Holbein portrait–Henry VIII himself. Wolsey (breezily): Sorry, girls, feudal edition of the show. The king has all the power. Anne (not giving up): What about them? (gestures toward courtiers) Don’t they, at least, get a say? Henry: But they all agree with me anyway! (Eyes them sternly.) Don’t you? (They nod a sheepish assent, except for Thomas More, who seems to be thinking about it.) So let’s see who’s been voted off, shall we? (Unfolds paper with a flourish): Catherine of Aragon! The tribe has spoken! (Grins engagingly at the camera.) I’ve always wanted to say that. Anne ( furious): What do you mean, “Anne Boleyn”? I won that contest where we had to dance with the French and Spanish ambassadors while balancing on a tight-rope! Henry (shrugging): Tough. The prize went to the one who did the worst job. (Steals a syrupy glance at Jane Seymour.). Not to mention, Annie, you weren’t supposed to win that courtly love competition either. Way too slutty. Headsman (for so he is): Chérie, chérie, is that ‘ow you greet an old friend? (Escorts her off the set, speaking soothingly.) Now, why don’t you just turn your neck comme ça and regarde that lovely display of French ‘oods in the shop window over there . . .
Jane: No fair! I was the one who had the SON! Henry (triumphantly): Anne of Cleves! (Turns to audience, shaking his head.) Boy, did she ever bomb the talent show . . .
Catherine (wrinkling her nose): What the hell kind of crappy prize is that? Besides, if I’m really the survivor, shouldn’t you be dead? Henry (pettishly): My, my, aren’t we impatient! Just hand me my iced tea. Henry: What the . . . (Recoils) What are YOU all doing back here! The producer didn’t tell me about this . . .
Catherine of Aragon (who is by the way quite sun-tanned): No, he didn’t. He was busy signing a contract with us for a new reality show: “Six Wives: Payback Time.” (Smiles evilly.) Tonight’s the first episode. Katherine Howard (kneeling by the open trapdoor and calling down excitedly): That’s right, Sweetums, you’re going on a cruise ship. How cool is that? (Giggles.) You get to cook and clean for the Amazon queen and her touring band of warrior women. Bon voyage! Anne of Cleves (yelling down too): Ja, and next week you wash by hand ze hundred dresses of Marie Antoinette—you know, ze ones with skirts so big and puffy? And you iron them too! (Straightens up and turns to the others.) Speaking of dresses, do I now get my make-over? Jane Seymour (consulting a schedule): Yes, but don’t forget next week’s my turn. (Smiles at Anne Boleyn.) Annie here’s promised to show me how flattering French hoods are . . . Very clever, and very witty Tamar, you are the well deserved deserved winner,. Congratulations. Glad to know you’re still an Anne enthusiast! Brilliant…and this coming from LA, known for smog, traffic, botox and lots of queens….